Split albums aren’t necessarily flavour of the month for everyone but they do serve a purpose, in particular with bands operating on a tight budget. 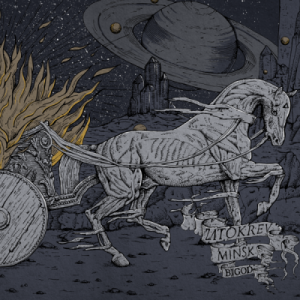 Bigod brings two acts together who are probably quite similar in both philosophy and sound; Zatokrev and Minsk. Of the two I’m more familiar with the former although it is Minsk who provide the first of the four tracks in the form of the slightly eerie minamilist ‘Invoke Revive’. Something of a transcendental trip, the ethereal waves that make up the first few minutes eventually have their allure broken by some very deep spoken words, although not ones that you are likely to make much sense of. So just as you’re adjusting to these mysterious messages in tandem with some fine plucked rhythms the Chicago post-metallers take things to a deeper level, with some slightly anguished cries bolstered by deepening grooves to create a more expansive soundscape. It’s not a bad opener and it’s followed by the first of the two tracks from Zatokrev, ‘Silent Gods’, which is an altogether more rumbustious affair. It’s a heavy beast alright with riffs that almost pin you to the wall, building in momentum as the vocals descend into the barbaric wails of the damned. Slightly confusingly the two respective singers add guest vocals on each other’s songs, perhaps as a way of highlighting their mutual respect and admiration. Either way, the 13-minute ‘Silent Gods’ is a real floor-shaker of a song, probably the pick of the quartet, building gradually towards a tumultuous climax which is almost suffocating in its spellbinding intensity. Zatokrev then move straight on to the more abrasive ‘Salvatore’ on which the emphasis is less on atmosphere and more on aggression. The flames here burn more fiercely as the Basle brigade dissolve into a full-on tortured cacophony through which discernible grooves only occasionally gain license to filter through the maelstrom. The final stages sees Zatokrev tumble under a flurry of harmonies, endorsing their avante garde reputation that makes them such compelling live performers and much loved by followers of the likes of Neurosis and Godflesh. Minsk wrap things up with the gently unwinding ‘The Chalice and the Digger’. Heavy melancholy drips deliciously from this highly fulfilling album closer, the ebb and flow of the opening flurries quickly swallowed up by a more intense battery of sound. Bigod featured in quite a few end of year polls and Minsk and Zatokrev, brothers in arms, toured this album across Europe last year. While bands from Chicago and Basle may not appear obvious partners in audio crime but the aesthetics and ambiance of these two respected acts means that this union has worked well. If either should cross your path in 2019 be sure to pay them a visit.